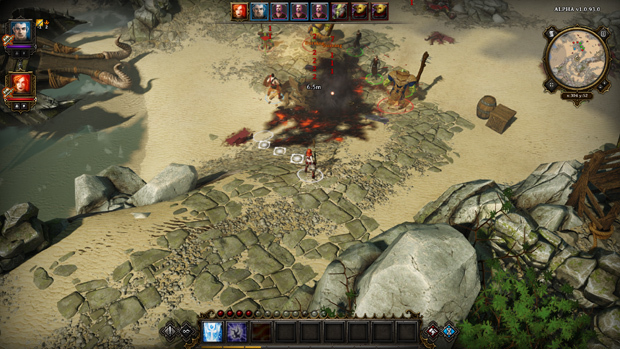 Divinity: Original Sin is an isometric “back to the past” style RPG. 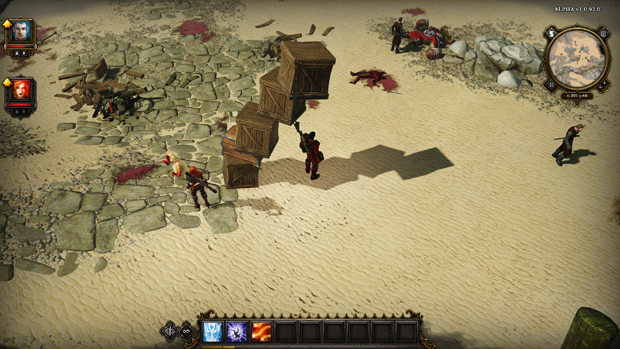 The game is brought to us by Larian Studios and shows a lot of promise. 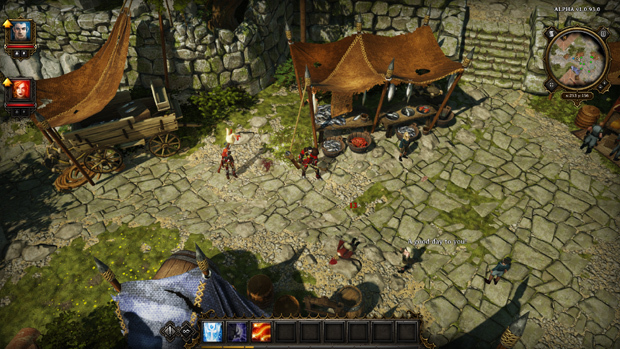 With a rich RPG world, interesting mechanics, and awe-inspiring turn-based combat, Divinity: Original Sin hopes to re-define the RPG genre. 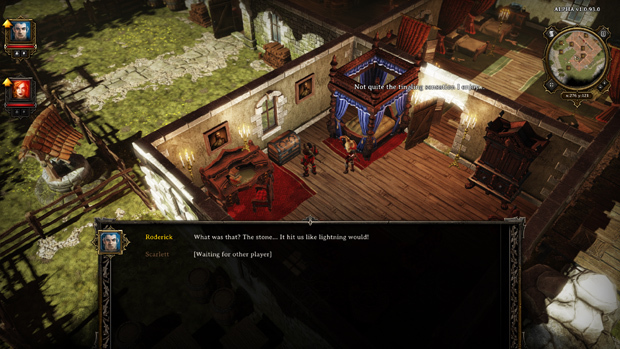 Some of the features include Co-Op conversations with NPCs, a diverse and detailed tool-kit to create your own adventures, and a great amount of interaction with the world around you. I’ll come out and say it right away, just fifteen minutes into the steam Early Access alpha version of the game and I’m already impressed and hooked. As the game is in steam Early Access and is still in early development, the world is obviously not complete. I am sure massive amounts of updates and polishing are in order in the world design, the lore, the storylines, and graphics. However, I can say that I am already quite pleased with what I’ve seen. 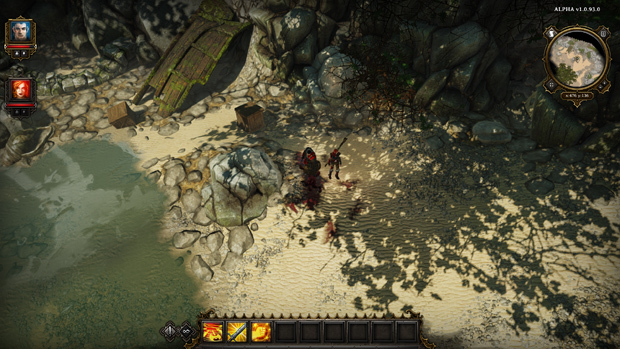 The graphics look quite nice for an isometric game, and there’s a lot going on. I was immediately able to tell I would enjoy the story-telling in this game, which is great considering I’ve been struggling to enjoy the stories in games lately. 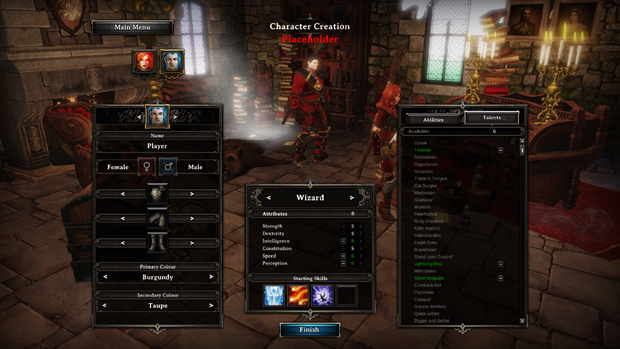 The art-style of the game is a mix of realistic models with bright colors and dark undertones. This means when you’re in a sun-light forest it feels vibrant and full of life, but when you’re in a torch-lit dungeon or building, it can feel a bit claustrophobic and grimy. Basically, it’s perfect for giving an experience that will allow you to immerse yourself in the game. Not a lot of games can pull that off, and I was honestly surprised to find that Divinity had so early in development. I’ve also got to mention that the music can help a lot with this, though it does need a bit of polish before you can get the full intended effect. Keep in mind the game is still early in development at this point, so what I say here may not be accurate forever. The character creation process doesn’t seem to be fully implemented yet, but you can get a nice glimpse at what will be available. 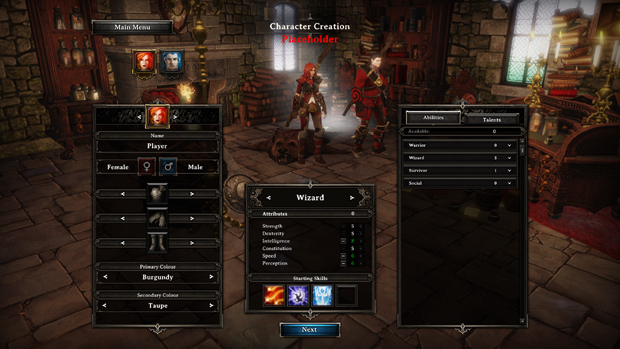 It seems you start by choosing a class, then you customize its stats, traits, and other factors. In this game, you control two characters (unless in Co-Op), so you get to do it twice. There isn’t much customization in the looks of your character, but that’s understandable considering that the game is very story-driven and already has two main characters (which you play). Speaking of Co-oP, there’s a neat little feature that doesn’t become immediately apparent until you try Co-Op. I’m not sure if the feature will make release, but my friend and I had a blast with it. After you make your first character, the person you are Co-Oping with can take control of it and move around the lodge you create the characters in. They can loot the shelves, weapon racks, etc… within the lodge, and it seems like the loot is randomized each time. We managed to get a lute one time and we found that hilarious, so it’s great that you can start having fun almost immediately – even before you’re in the actual game. Once you’re finally in the game, there’s already a decent tutorial to introduce you to most of the concepts, so it’s easy enough to pick-up on what you can do. One of the things you learn early on is how easy it is to manipulate the items within the world. From regular branches, to wooden crates, you can move them around and place them freely, which can make for a lot of fun while experimenting. My friend and I spent a good fifteen or twenty minutes just stacking things, trying to see how far we could get the stack to lean. That’s why I love sandbox elements to games. If developers provide a few tools, the players will find ways to entertain themselves and have a blast with their game. Another concept you learn early on is how much the world interacts with each other. From dropping barrels of oil onto a group of enemies and then having your friend set it on fire and let them burn, to casting a rain spell to put out a raging inferno. There’s a lot of things that interact and it reminds me a lot about Magicka, just with a focus on how your spells, items, and world objects can interact with each other, rather than mixing elemental types to create epic spells (at least as far as I know). But speaking of spells, there are a ton of neat ones so far. I have fond memories of setting off a tornado in the middle of town and quickly finding myself almost dead from my own creation before the angered citizens took it upon themselves to do the job. And that brings up my next topic: The game is full of freedom. In my first two hours in the game, I probably spend fifteen minutes of that actually following the quests. The rest were just me wandering around, participating in random events, sneaking around to find loot, and testing out what exactly I could do in the game. I love that I can just spend time exploring around, and yet find myself in seemingly random situations in which I feel like a hero (or a villain if I want). I haven’t felt this kind of freedom since Morrowind and Neverwinter Nights 1 & 2. Next up, I want to discuss the combat. Initially I was a bit put off by the mention of turn-based combat. My mind immediately went to Final Fantasy-style turn-based combat and I didn’t think I would enjoy it. Boy was I proven wrong when I actually got into some fighting. It was intense, strategic, and pretty epic looking. Specifically the spell effects were awe-inducing, as there’s nothing like watching the area light up as two fireballs rise up and then hurdle towards your enemies. Rather than Final Fantasy, the combat is closer to Xcom or the original two Fallout games. At the beginning of each turn, you’re given some Action Points (AP), which you can spend attacking, using abilities, or moving. Balancing out your use of AP so you can get the maximum use out of each point is something that can require a bit of thinking, something that people may not be used to with the recent popularity in hack-n-slash type RPGs. I was happy with how quick the combat grew on me, and I’m actually considering playing the above mention Xcom (I own it, just haven’t played it yet) game just so I can have more fun with this type of combat. Can’t say I was disappointed at all, and I can’t wait to see how the game evolves with new classes and abilities added. This is a part of the game that really stood out. I initially gave the game a quick go for about fifteen minutes by myself before I invited a friend to join me and we got on TeamSpeak together to play. From start to finish, our two-hour play session was a blast and full of laughter. Sure, a bit of that laughter was at exploiting bugs for funny outcomes (such as being able to kill ourselves for exp), but most of it was because of all the fun we had playing the game. I usually don’t play Co-Op games as it’s often done horribly and isn’t enjoyable at all. Usually, unless you’re the “main” player, you’re just there for the ride. 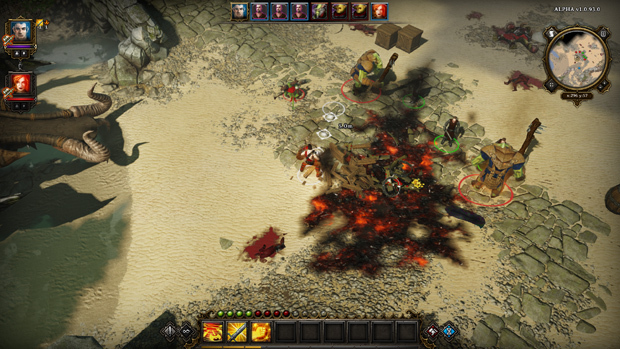 However, in Divinity, the game was made with Co-Op in mind. You can tell right from the start that the devs intended this game to be played with a friend. From the often-times hilarious conversations you can have with your fellow player that can have a beneficial end in one way or another, to working together in combat, it just works perfectly. In most games, you’re forced to stay together on the screen, even if you’re playing on two different machines with two different monitors. 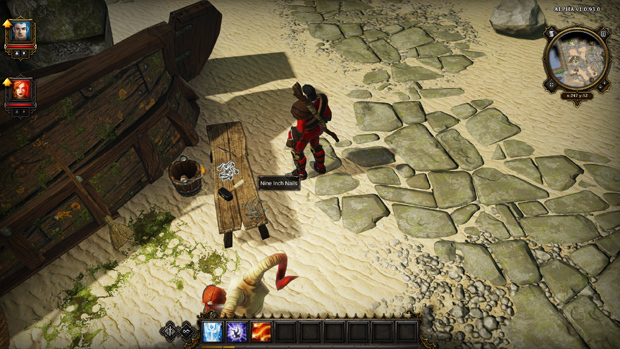 In Divinity, while we’re in town I can go about doing my business (which usually involves teleporting poor citizens and vendors to their death) while my friend does his. Rather than just a tag-along experience, you’re truly playing together with your friend and that’s just not an experience that can be beat. As you can see, I was more than a little impressed with Divinity: Original Sin. It looked good on paper, and the real thing was fantastic. Rarely am I able to read up on a game, be hyped about it, and then actually have my hype rewarded with a fun, playable game. Even though it’s in early Alpha, there’s still a great deal of enjoyment to be had. 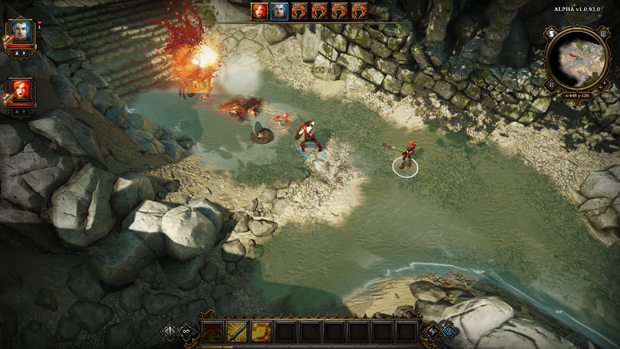 If you’re interested in Divinity: Original Sin, look for it on Steam where it’s available on the Early Access program for $40. I had a fantastic experience and would recommend it to anyone that has friends to play with. However, I cannot stress enough that the game is still in early Alpha, so please don’t buy it expecting a full and complete game. KOG Games (Kill3rCombo) acquires rights to publish their first action brawler, Grand Chase.